Tim Holtz Sizzix WILDFLOWERS Thinlits Die 661190 at Simon Says STAMP! 661190 This item is on reserve until If you would like to reserve this item now, you may purchase it now with the rest of your order. We will hold your order now and ship your entire order as soon as this item is back into stock. If you would like your order to ship now, please place this item on a separate order. 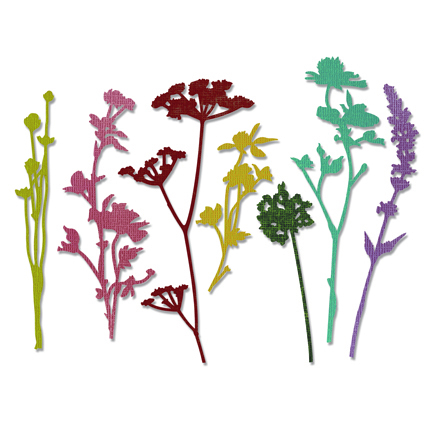 Success, Tim Holtz Sizzix WILDFLOWERS Thinlits Die 661190 has been shared! Thinlits create dazzling detailed shapes for more creative cardmaking and papercrafting projects. These wafer-thin chemical-etched die sets are designed to cut, emboss or stencil a single sheet of cardstock, paper, metallic foil or vellum. They are simple to use, compact and portable for cutting at home or on the go. Use them for enhanced intricacy and to add a special touch of inspiration to all your projects. This Thinlits Die Set showcases the bold and edgy style of Tim Holtz. His unique artistry can be seen throughout the dies in this set which are compatible with the BIGkick, Big Shot and Vagabond machines. To cut, the sandwich requires use of a pair of Cutting Pads and the machine's included Platform; when using the Essentials Platform or Solo Platform & Shim, the Extended Adapter or Solo Adapter is required. Because of their intricacy, Thinlits Dies may require up to three passes to cut. If extra ejection is needed for easier separation of the die-cut from the design, place wax paper between the Thinlits Die and your material and then cut. These dies can also emboss when the machine's included Platform is combined with an Impressions Pad and Silicone Rubber sheet. The diagrams on the Platform offer easy guidelines about how to make the perfect Sizzix sandwich. To stencil, place the die over desired material and apply ink or chalk to the die indentations. This technique can be used alone or to enhance embossed designs. This set includes a handy storage envelope. For easy identification, trim off the packaging front flap, keep and slip into the envelope. All items sold separately.